When you’re grieving, you need support and comfort, and How to Heal a Grieving Heart provides practical and spiritual help. Each page of this small, full-color gift-style book (a companion to the Talking to Heaven Mediumship Cards) contains a comforting message to help grieving people come to terms with their loss. The content is simple and direct, because the authors know and respect that grieving people often have difficulty concentrating and following through on what they read. The reader can open up to a random page, designed with beautiful colors and typeset in attractive fonts, and meditate upon the entry. 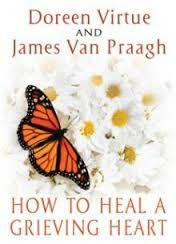 Doreen Virtue and James Van Praagh wrote the book that they wished they could have had when they were both grieving losses. Based upon their years of experience as grief counsellors and mediums, Doreen and James have created a gentle book that is a perfect gift for a grieving friend.